Meet Kif, a beautiful, calm, 7 year old, gray male. 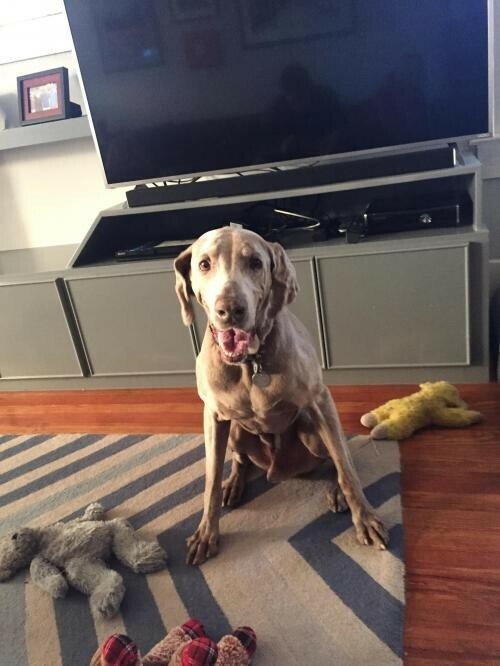 Kif is your typical velcro Weim and loves his people. He gets along well with his foster sibling and enjoys going out on leisurely walks as well as cuddling up with his foster parents. He does well around all people, including kids, and loves attention. He is housebroken as well as crate trained, although he does not need to be crated when his foster parents are gone from the house. Please ask about KIF when you contact Weimaraner Rescue of Texas. For donations, please make your check payable to Weimaraner Rescue of Texas, Inc. 4347 W. Northwest Hwy, Suite 130, Box 184 Dallas, TX 75220 Phone: (972) 994-3572 www.weimrescuetexas.org We gratefully accept donations of any amount to help our beautiful gray & blue friends in need. We are an all-volunteer, 501(c)(3) non-profit, charitable organization. Donations are tax-deductible as allowed by law. Our rescue Weimaraners are current on all vaccinations and heartworm preventative. They are spayed or neutered, and microchipped. The adoption donation is $300.00 for adult Weimaraners, $350.00 for puppies, who are old enough to have been spayed/neutered, $450 for puppies who are not old enough to be spayed/neutered, $100 refundable deposit included and $250.00 for seniors.